Fast Hips and Chocolate Chip Pancakes (Hawaii Day 6) | Kimberlee K.
As any perfect Saturday morning would, this one started with pancakes. The first day we arrived in Maui we noticed the restaurant, “Slappy Cakes,” across the street from our hotel, and after the past few days of early morning wake up calls, we thought Saturday would be perfect for a late pancake breakfast. Now, this is not your ordinary pancake house. While there are a couple of house favorites on the menu, Slappy Cakes offers a unique, DIY pancake option, that allows you to choose your batter, fillings, toppings, and syrup, and then make the pancakes the way you want them, on the griddle installed in the middle of your table. The batter comes in a squirt bottle, giving you much more control over the shape of your pancakes, so we took the freedom and ran with it, first making hearts and squares, and then going full 4th of July theme with a United States map and a bald eagle. The way we saw it, there is no wrong way to thank the troops for everything they’ve done and continue to do for us. 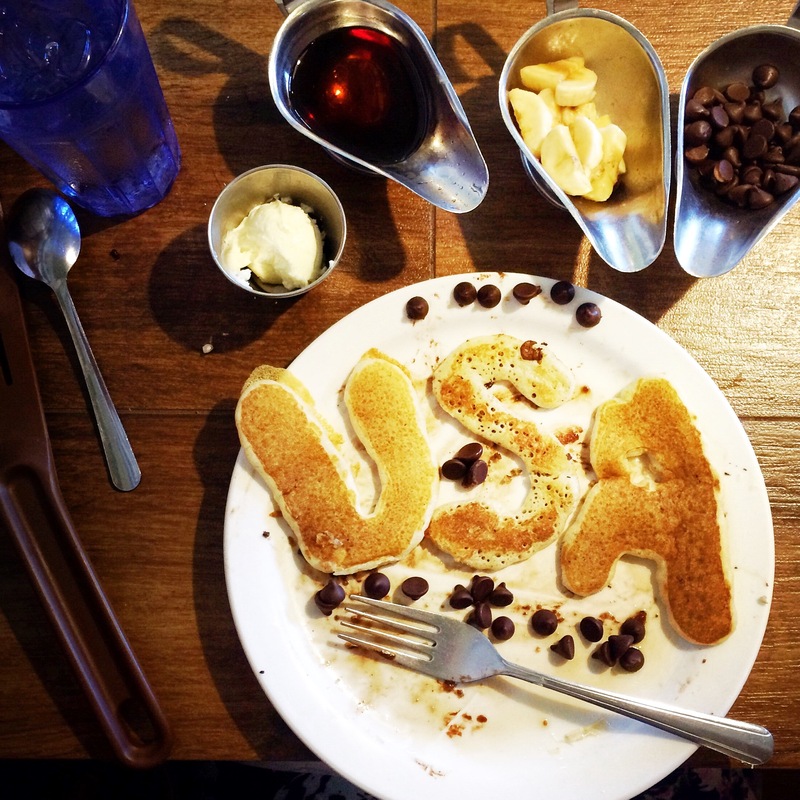 Showing patriotism in our pancakes may seem like a small gesture, but being able to sit comfortably and safely in a pancake house on a Saturday morning is a privilege we’ve been given thanks to their sacrifice. Around 5:30 that night, I got laid by a buff Hawaiian man. Oh. Excuse me, lei’d. As we walked into the Old Lahaina Luau, we were each given a purple lei and a Mai Tai before being led to our seats. Our waiter then informed us that the bar was open, dinner was at 6 and to enjoy a look around in the meantime. 5 minutes in, my brother came running over, informing us he’d bought a hand carved knife and was going back for a battle-axe. At first we laughed, but by the 20th minute, our group of 15 had purchased 2 knives, a battle-axe, 2 battle turtles, and 4 tikis. Needless to say, the men at that booth loved us. Soon after, my sister and I asked a man to draw us. As in a caricature, not Leo Di’Caprio, naked Titanic style. Don’t get weird. 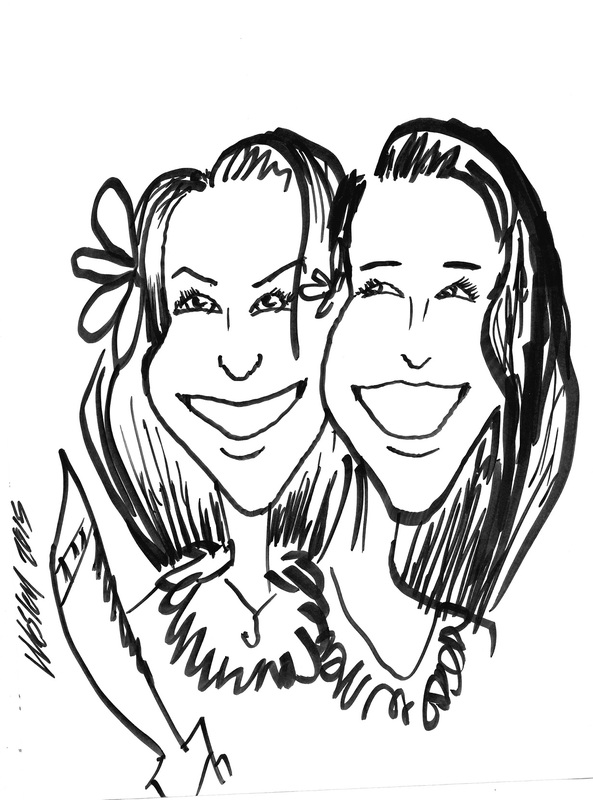 I think the finished product really captures our essence: two girls with a hand carved knife that just got lei’d. A true classic. The traditional way of cooking a luau pig is underground on hot rocks. So as we congregated around the pile of dirt, two men began to dig. With each shovel full, the heat radiated stronger from underground. The men explained the complicated cooking process, including the 3 am start time, and lifted the platform holding the pig up onto their shoulders to carry it back and carve it. After dinner, we were treated to a number of Hawaiian dances, featuring both men and women that told the story of Hawaiian culture. It was truly beautiful to watch. The passion the dancers had for sharing their culture was obvious; it wasn’t just a job to them, it was a genuine invitation into their culture. Now for a brief, less serious, slightly inappropriate, bout of commentary on the dancers, let me just say: THOSE HIPS. Those lightning fast hula hips. Amazing. That is all. We left the luau with an undeniable sense of happiness and wonder, so we made the obvious next move: raiding the sale on macadamia nuts at Longs Drugs. Knee deep in alcohol and Hawaiian culture, we bought 10 boxes of Hawaiian Host Macadamia Nuts. Then we called it a night. Where are those crying-laughing faces/emoji’s I need so badly right now?? I now have a $50 warrior tiki on my fireplace mantle protecting me!! Thank GOD! You guys are too funny! Sounds like everyone did some redecorating! Pingback: How to: See Portland in One Day | Kimberlee K.